Prior to joining as Cromwell’s Sydney based Leasing Manager in mid-2018, Lisa Treble established herself as a successful leasing agent on Sydney’s North Shore. We sat down with Lisa to discover what her role entails, the challenges of the Sydney market and the evolving needs of today’s commercial office tenant. I am Cromwell’s Sydney-based Leasing Manager. I am responsible for ensuring any vacancies within our Sydney and Canberra assets are leased with the least amount of downtime. I also need to be strategic with these vacancies to ensure the total asset is considered when doing a leasing transaction to ensure we maximise leasing income and guarantee the overall strategy of each building is met. At the building level, I negotiate lease terms for prospective tenants, review the condition of vacancies to confirm they are presenting the best way to the market, and ensure letting up periods are kept to a minimum. Beyond each building, I also liaise with agents to make sure Cromwell is on top of what is happening in the wider markets in which we operate. What are some of the challenges of the Sydney market at present? The market is moving so quickly. Overall in Sydney, vacancy rates are at record low levels, which is creating a competitive marketplace for prospective tenants. The key challenge is managing tenant expectations of what they think a market deal is compared to what the market deals actually are. How are tenant expectations of their workplace changing? The way in which tenants are working in their offices continue to evolve. Staff are working different hours, and the reality is that employees don’t have to go to the office to work anymore. This is resulting in a continued shift towards a tenant-focussed, holistic lifestyle offering. Employers need to offer the best workplace in order to retain the best talent. Traditional offerings such as extensive natural light, open plan floors that facilitate connectivity and collaboration, sustainable features and greenery are still integral. However, lifestyle offerings with a focus on wellness are becoming increasingly important. End-of-trip facilities, comprised of lockers, bike storage, changing facilities and other amenities have become commonplace in the market, but continue to evolve. Proximity to a wide range of retail and transport options is also vital to tenants. Are there any recent Cromwell leasing deals that stand out? 207 Kent Street in Sydney’s CBD has been a standout. A whole floor lease transaction was completed in January last year. Six months later, we completed another whole floor lease transaction with a 15% increase on the rental we achieved earlier in the year. In the last few months, we’ve also signed three new leases in the building totalling 998 sqm, 1,021 sqm and 1,569 sqm respectively. A recent deal at Northpoint in North Sydney has also been a highlight. We achieved over $1,000 per square metre for a commercial office, which is a great achievement for the North Sydney market. Prior to joining Cromwell midway through 2018, I spent the previous 15 years as a Commercial Leasing Agent working on Sydney’s North Shore with Colliers and CBRE. I studied throughout that time and have an Advanced Diploma in Property (Valuation). I enjoy hiking, getting out either in the mountains or a coastal walk. When I’m not hiking, you’ll find me on a more local walking track with my dog. Cromwell acquired the 20-level, PCA A-grade 207 Kent Street in mid-2013. The building overlooks Darling Harbour and is adjacent to the Barangaroo precinct on the western side of Sydney’s CBD. 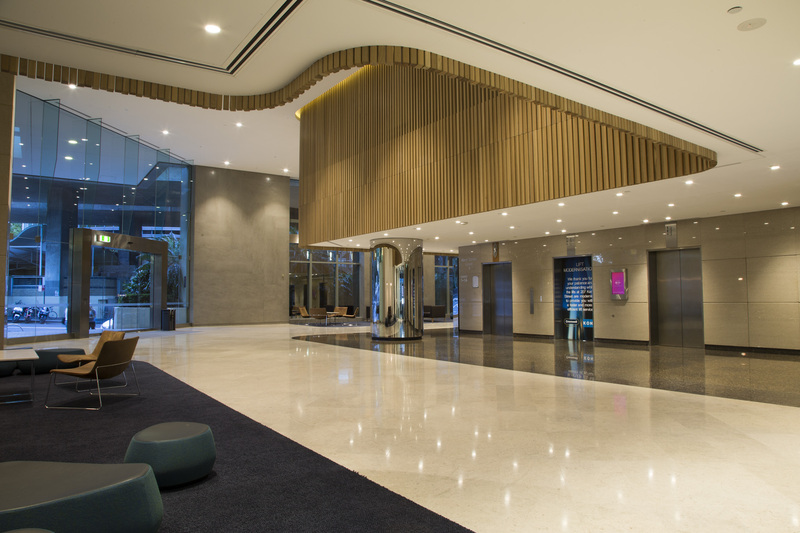 In 2014, the building underwent a refurbishment to modernise the lobby, as well as upgrading the secure end-of-trip facilities. The investment helped increase the building’s NABERS Energy rating to 4.5 stars. Additional building amenities include conference facilities, a café, attractive garden and outdoor area, as well as access to local conveniences including Wynyard walk and train station, bus and ferry links. Extensive dining and entertainment options offered by Barangaroo and the wider Sydney CBD are also close by.